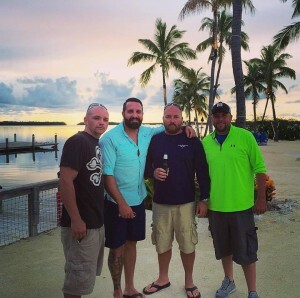 This summer, Nick and his Marine Corps friend Tommy took a couple of veterans on a Freedom Alliance fishing charter to the Bahamas. The trip was an immediate winner, and that being so, we proposed another. With Nick’s numerous connections to other Marines, he is in a perfect position to find the ones most in need of a fishing expedition. We call him our MARSOC Ambassador. 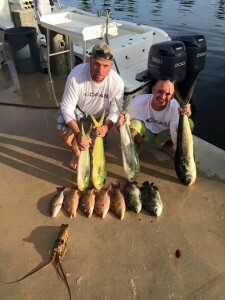 The Florida Keys was the destination for this early fall fishing charter. With Brian Peachey, who organizes the annual Grouper Grapple in Fort Meyers Beach, Nick and Tommy hosted Marines Jeremy and Russell. Brian and a friend gave the men two days of fishing on-board a 36-foot Yellowfin yacht and a 28-foot Mako. Over two days, the crew had enough fish to fill an ice chest, even after they polished off some of their catch for dinner. One of the guests said that after a whole day of fishing, he hadn’t slept so well in years—and that was without his prescribed sleep meds! Jeremy hopes to participate again one day. “I can say with 100-percent confidence,” he said, “that programs and events like this are beneficial to … combat veterans, in order to connect (or reconnect) with other like-minded individuals. Russell, who left the Corps only a year ago, opened up with us about how much he needed this getaway. He talked about how hard it was to leave his band of brothers, whom he considers family. These days he works 60 hours a week and comes home to put his two kids to bed as his wife leaves for the graveyard shift. There are financial, emotional, and relational issues to sort out. And he’s by no means the only retired service member struggling to make their new life work. Many must learn a new career, adjust to life with disabilities, and deal with emotional stress. 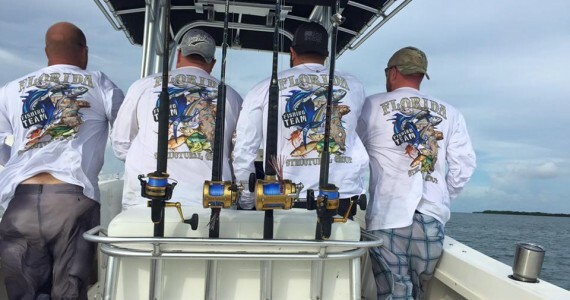 For these veterans, a fishing trip becomes more than just time in a boat. “This past weekend has given me a reset,” Russell told us. “Everything, from the road trip down, swapping stories and just talking about life after leaving the military, to quiet time on the water where nothing was said … just knowing it was our time to be in peace with no distractions. Russell also says he looks forward to taking his son fishing, now that he’s experienced the pleasure for himself. Both he and Jeremy want to tell their Marine buddies about Freedom Alliance, what we’ve done for them, and what we can do for others, too. Thus, thanks to donors and participants, the cycle of giving carries on, and the mission of Freedom Alliance perseveres.